The CRPL team are very excited to announce that our website is now up and running!!! Please visit www.lwiroprimates.org to learn all about us! 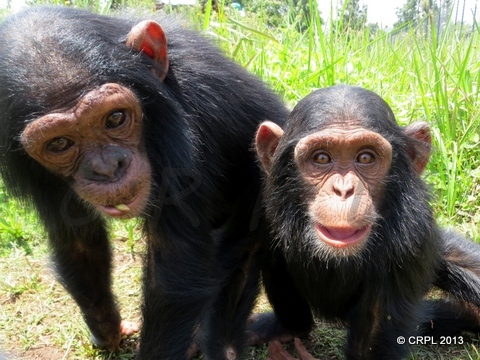 The Harmony Fund is running a special 'Chimp Week' campaign to raise funds for both the Lwiro Primate Sanctuary in DRC and Limbe Sanctuary in Cameroon. 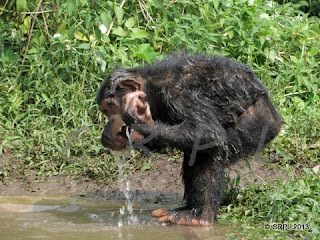 All of the funds raised will go toward the general care of the Chimpanzees at the two sanctuaries. You can even choose what your donation will buy! 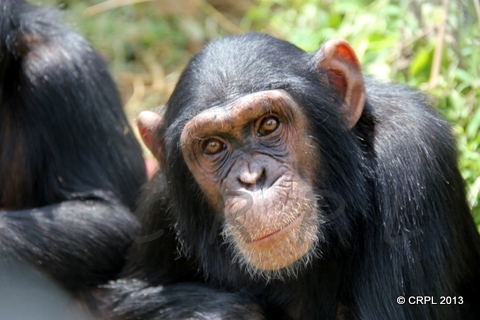 Join the 'Chimp Week' campaign! 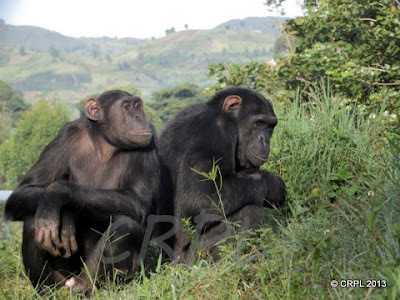 Ascanius Monkey Habitat Now Open! The CRPL is very pleased to partner with Columbus Zoo in announcing the completion of the newest enclosure at the sanctuary. Thanks to funding from Columbus Zoo, the CRPL has constructed their most recent Monkey Habitat for Conservation and Education for the next group of monkeys. The monkeys moved into this new habitat were 14 Ascanius, or Red-Tailed, Monkeys and 2 Dents Monkeys. Construction of the habitat commenced in November 2012 and took roughly 5 months to complete. 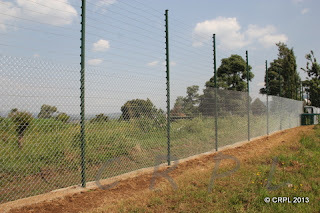 The habitat measures 18m by 12m in length and stands 3m high, along with an additional dormitory with 2 rooms. 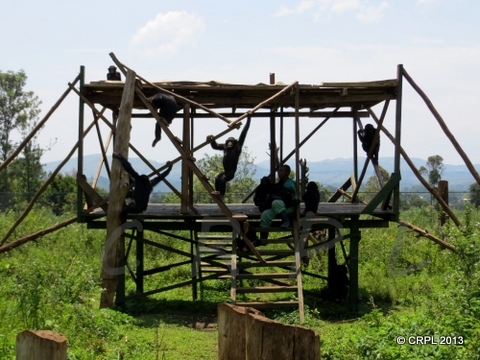 Additional climbing structures were added to the habitat as well as large hills, a small pool and feeding platforms. The frame starts to go up. 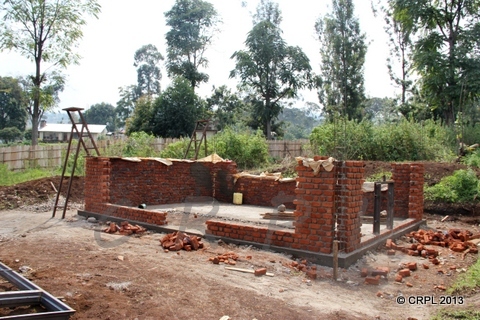 The frame is cemented into place and furniture for inside is being constructed. The frame is finished and the mesh is going on. 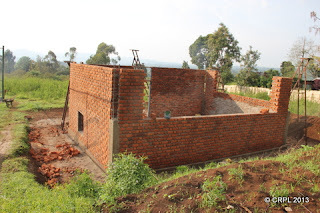 Finishing touches on the dormitory. CRPL staff moved the 16 monkeys from the previous concrete and metal cages in the old sanctuary, up to the new facility in the last week of March 2013. 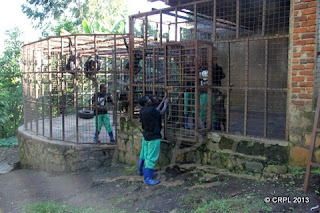 The monkeys were monitored closely over the following week to ensure that they settled in to their new facility calmly. The Ascanius and Dents Monkeys appear to thoroughly enjoy their new habitat, in particular the insects that they can catch in amongst the shrubs and plants. Keeper Jacques takes one of the Dents Monkeys from the old sanctuary. The keepers getting ready to move one of the male Ascanius Monkeys from his old cage. And in to the new habitat! Pole Pole, one of the Ascanius Monkeys rescued from Uvira last October, arrives at the new habitat. All the monkeys get a "mugshot" for our records. Checking out the new habitat. Pole Pole watching for insects. Hatari with youngster Bonne Anee, enjoying some lunch. This new habitat is vital in not only improving the welfare of these monkeys, both mentally and physically, but it is the vital first step in their rehabilitation to the wild. It is fantastic to see the Ascanius and Dents Monkeys out in their new naturalistic habitat and the CRPL would like to send a huge thank you to the Columbus Zoo for funding this project. 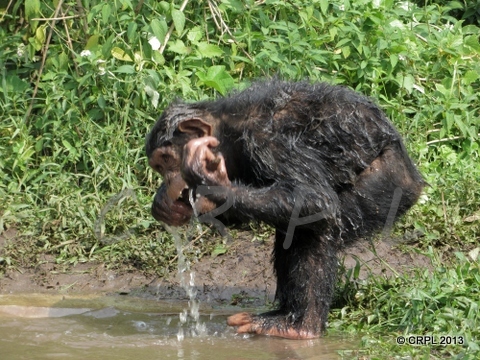 The favourite new pastime of the Ascanius Monkeys is catching insects. The CRPL would like to acknowledge and thank Peptech for their kind donation of contraceptive implants to assist us in our work! Peptech has offered us support in the past and we are so grateful for their continued assistance! Thank-you! 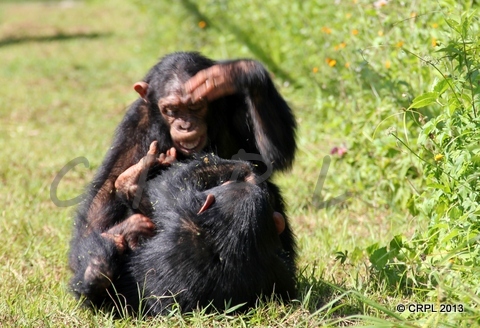 Infant Chimpanzee Habitat Now Open! The CRPL is proud to partner with Fondation Ensemble in announcing that the Infant Chimpanzee Habitat has been completed and the infants have moved in! 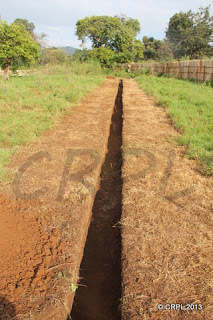 Foundations are dug for the fence. The upright posts go up and the electric system is installed. Work commences on the dormitory. The dormitory is taking shape. The mesh is installed on the fence of the enclosure. Construction begins on the climbing frame. 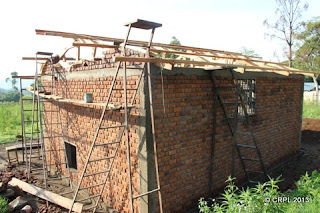 The roof going on to the dormitory. Construction work finished up in the end of January and in the beginning of February the 13 infant chimpanzees were relocated up to the new facility. 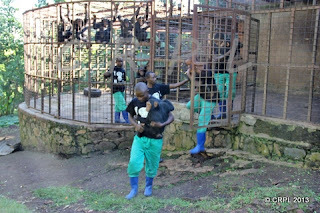 The 8 younger and smaller chimpanzees; Mbandaka, Beni, Walikale, Itebero, Kirikou-Grace, Lugushwa, Rambo and Lulinga were moved in twos and threes by their keepers, who carried them out of the old concrete and metal enclosure, into the waiting car to drive the short distance to the new facility where they were carried in to the dormitory. 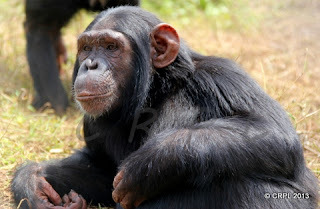 The 5 bigger and more boisterous chimpanzees; Sakina, Mangay, Loia, Butembo and Aketi, were given a slight sedation, transferred to a pet pack and driven to the new facility. 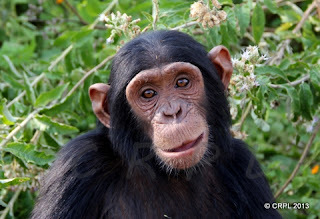 The younger 8 chimpanzees went out into the exhibit the first day and the older ones whom had received sedation waited until the day after. 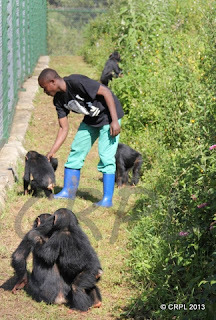 Moving day and the keepers take the smaller chimpanzees from their old cage. 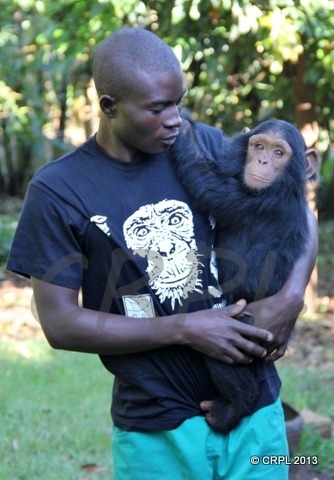 Keeper Ombeni with infant chimpanzee Kirikou-Grace. The keepers leaving the old cage with some of the younger chimpanzees. 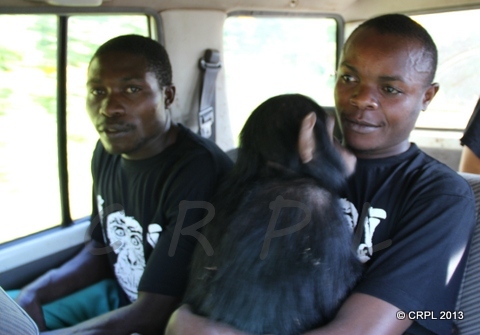 Keepers Claude (l) and Bisimwa (r) with Lulinga, in the car driving the short distance to the new facility. 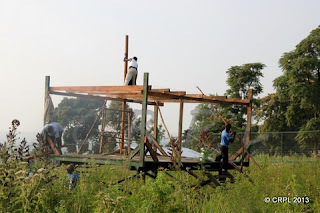 Lulinga arriving at the new facility. Some of the youngsters clung to their keepers, we had extra keepers inside with the infants for the first 2 weeks to help teach them about the electric fence, how to get water from the drinker and to generally settle in. 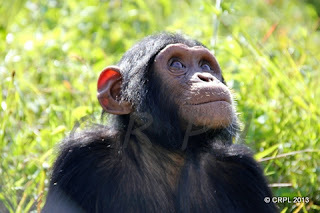 However, there were some surprises, for example Itebero, one of the youngest chimps, ran out of the tunnel and straight off into the bushes! Every now and then he would come flying past as he did a lap of the exterior perimeter. Generally, all of the infants enjoyed running and stamping their feet on the grass. Having been housed on concrete floors, some of them for years, it must have felt nice to have grass beneath the feet. 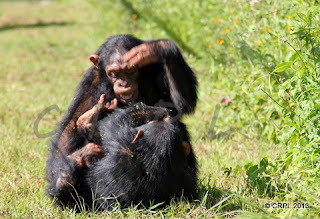 The first time out in the new enclosure, keeper Bisimwa helping Beni, and Walikale clinging to one of the older chimps in front. Mama Dorcus holding Mbandaka, with Rambo standing and Beni sitting at her feet. Some of the more careful infants! 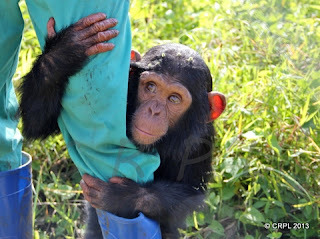 Walikale is sticking close to the keepers on his first day out! Rambo enjoying the new enclosure. The lovely Sakina, enjoying her first day out the next day. 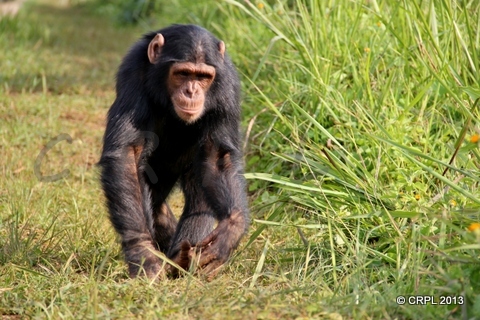 Aketi, the chief of the infants, out for a walk. Rambo is quite the poser! Lulinga, always easy to tell with those distinctive ears sticking out! Loia has the darkest face markings of all the infants. 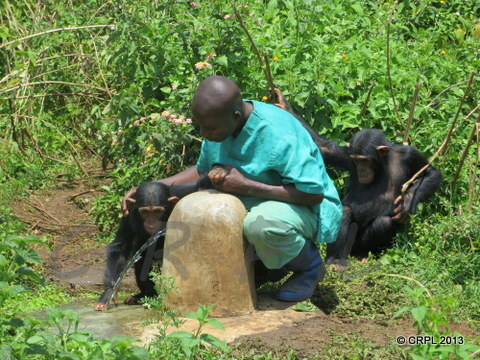 Keeper Amani teaching Walikale where to find water. We are now back to just one keeper inside with the infants at all times and they have settled in to their new habitat well. The younger ones, particularly Mbandaka, Beni and Walikale, still stay close to their keepers, Armani and Bisimwa, whilst the others disappear off into the bushes for periods of time to play and chase each other. 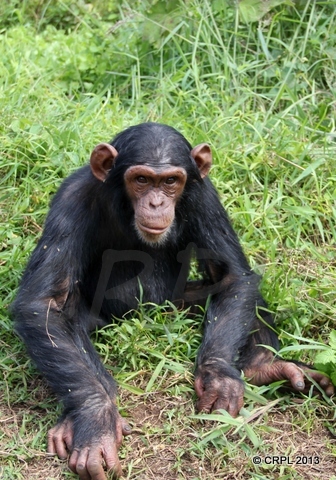 At night, when they all go to bed inside their dormitory, they are 13 very tired little chimpanzees! All the infants out enjoying the climbing platform. 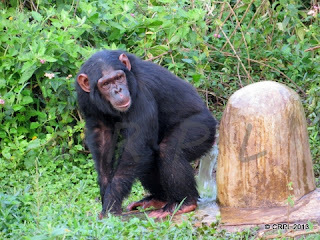 Sakina using the water fountain to clean her, err, rear! The CRPL would like to express their gratitude to Fondation Ensemble for funding this amazing project and helping us to get the infant chimpanzees out into a natural habitat. Thank you from the whole team at CRPL! Everyones favourite dynamic due, Itebero and Walikale. Toilets. Not the nicest of subjects but still a necessary component of any sanctuary. 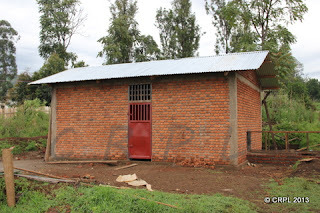 The new facility at the CRPL has gotten a new toilet block and shower for staff. Yes, they are toilets, but we still think they are pretty! The 2 smallest chimpanzees at the CRPL have settled in well with the nursery group, now totalling 13. They are very popular with the bigger infants and there were fights over who got to hold the newest babies! Lulinga in particular has proved a wonderful mother figure and is always with one of the youngsters and sleeps with Mbandaka every night. Beni is sweet and timid, however she is playing more and more and growing quickly. 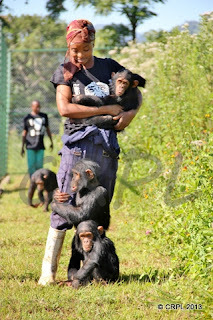 Mbandaka is highly intelligent and not afraid of anything, she will be a real power house when she grows up! Photo 1. Beni with Lulinga and being groomed by Lugushwa. 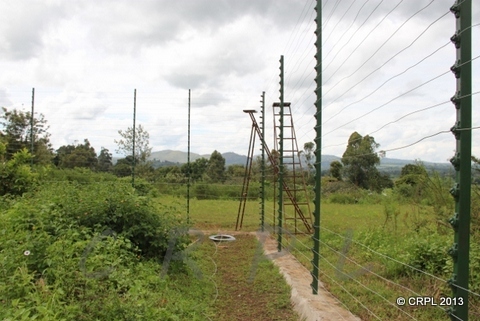 100% of the money donated through here will go to Lwiro Primate rehabilitation centre, CRPL. 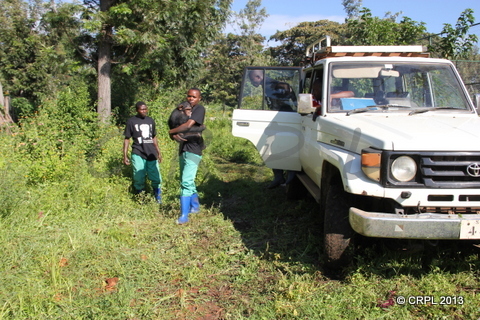 Lwiro is situated 4km south-west of Katana. Current campaign: We have now reached the target for the campaign for new mattresses for the maternity hospital in Lwiro. Watch this space for the next campaign!